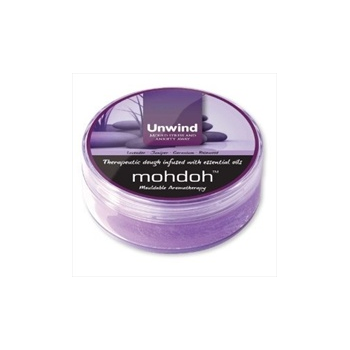 Home › Sensory › Smell › Mohdoh Unwind Mouldable Aromatherapy - relief from Stress and Anxiety. Mohdoh Unwind Mouldable Aromatherapy - Mohdoh is an aid for helping with everyday ailments from insomnia, travel sickness, worry and anxiety to colds and flu, lack of focus, hyperactivity, headaches and tension. It is available in breathe, calm, headeez, sleep, think, travel and unwind. The synergistic effects of touch and smell help to treat a number of stress related complaints and the squidgy, putty like, tactile nature of the dough has in itself a soothing, calming effect. Unwind is a powerful remedy that combines the proven elements; aromatherapy, play therapy and colour therapy to create an extremely effective yet fun way of providing relief from all forms of stress and anxiety. How it works! As the Unwind dough is played with the carefully selected essential oils are vaporised and inhaled providing fast and effective relief from stress and anxiety. At the same time the specially selected colour of Unwind helps you to regain peace and quiet and regain focus. These unique, therapeutic elements combine to form a powerful, holistic therapy that really works. Unwind is 100% non-toxic, fully complies with EN71 safety legislation and uses only the purest natural essential oils. Email a Friend Mohdoh Unwind Mouldable Aromatherapy - relief from Stress and Anxiety. Bookmark Mohdoh Unwind Mouldable Aromatherapy - relief from Stress and Anxiety.